With the state facing a $2 billion budget shortfall in the fiscal year starting next July 1, you might think candidates for governor would promise to hold the line on taxes and hope lucky lightning strikes to somehow avert an increase. Not on the Republican side. All of them — from Steve Obsitnik, who’s the most cautious, to the unrealistic extreme of Bob Stefanowski — are promising huge tax cuts on the way to balancing the budgets of the next eight years. That’s the heart of economic plans on the GOP side. We also see some good ideas to create jobs and growth and a universal call to restructure pension liabilities, the official state albatross. And of course, they’re all promising spending cuts to make their plans work. Those avowed cuts range well into the billions of dollars in some cases. Never mind the fact that Gov. Dannel P. Malloy, the Democrat not seeking re-election, has cut somewhere between 6,000 and 7,000 state employee jobs without reducing overall spending, because of those rising pension, health and debt payment bills — generated by Democrats and Republicans alike — coming due. Republicans in the General Assembly — none of whom, by no coincidence, are among the final five candidates on Tuesday’s primary ballot — have barely managed to suggest cuts of a few hundred million dollars when they were asked to weigh in. Even doing that required trickery and largely unrealistic measures such as assuming state employees would lose collective bargaining rights when the current deal ends in 2027. With that as a backdrop, let’s look at highlights of the five GOP governor candidates’ economic plans. Everyone talks about transportation plans, without tolls, and I’m leaving those out for space. David Stemerman has the most detailed plan and Obsitnik is not far behind, but they’re here in alphabetical order starting with the endorsed party candidate. Big Idea: Immediate reductions in the state income tax, with lower income earners getting the biggest percentage cuts; eliminate the income tax in 10 years. Comments: Boughton, the 9th term Danbury mayor, doesn’t go into a lot of detail in any of his ideas. The big one, elimination of the income tax, would require cutting or replacing $9 billion to $10 billion a year, half the state’s tax revenue. Recall, when the tax began in 1991, taxes on capital gains, dividends and business profits dropped sharply, though not as much as the new tax raised. He’s counting on voters recognizing in him an experienced hand in state and local government with a proven ability to get along with lawmakers and actually execute the an economic blueprint that’s a down-the-middle Republican plan. he fact that he’s had to raise taxes in Danbury hurts him politically, but then, few if any cities or towns have averted tax hikes. Highlights: Immediately eliminate the income tax for anyone making $75,000 or less; abolish the estate tax, the business entity tax, the income tax on Social Security payments; reduce business taxes; “reduce,reform and eliminate duplicative and excessive regulations”; generally reduce bloated government. Click here and here for plan. 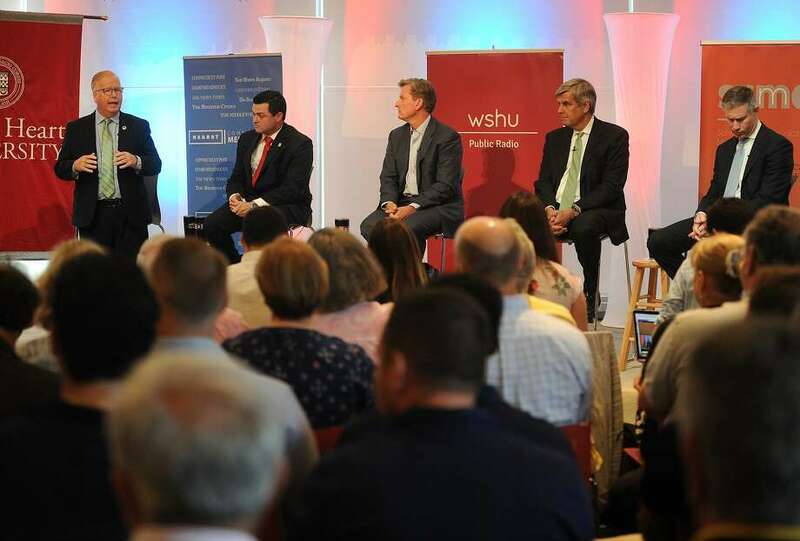 Comments: Alone among the candidates, Herbst leads with “restoring law and order” along with the pension crisis, an oddity considering violent crime has dropped more in the Malloy years than in any other state. Herbst’s economic plan contains by far the least detail of any, with no suggestion of how to pay for massive tax cuts and no guide to how he would reform the DMV and the rest of state government. To his credit, he does not promise to eliminate the state income tax. And as Trumbull First Selectman for eight years until the start of 2018, his tax increases were well below average for a municipality — though he did have increases in most years. Big Idea: Create 300,000 jobs over eight years with a centerpiece of public-private partnerships along “career corridors,” both geographic and by industry, with at least one major national research university involved. Similar to successes in Boston, Pittsburgh and on Roosevelt Island in New York City. Highlights: Restructure state’s pension and benefits plans to save at least $1 billion a year, including elimination of cost-of-living increases and moving of state assets such as lottery revenues into pension funds; reduce size of government by $2 billion, largely through privatization and consolidation; reduce Medicaid spending by $500 million a year by shifting to outside management; bring more government services online; support charter schools and outcome-based education while eliminating minimum local spending levels; dramatically increase industry apprenticeships in partnership with companies. Click here for plan. Comments: Obsitnik, like Stemerman, goes into far more detail than highlights can capture, calling on his background as a Naval Academy graduate, submarine officer and founder or co-founder of three tech firms. He’s more eager to work with unions than other GOP candidates but willing to bring down the hammer on pension issues and other givebacks. He’s very specific on numbers — $3.8 billion in added revenue from economic growth, for example — but the plan still relies on addition by subtraction, which has proven elusive in places like Kansas that have tried it. The jobs engine idea through partnerships is innovative but to put the numbers in perspective, a good year is 16,000 jobs, or 1 percent, and we’ve had few of those. His plan calls for more than double that, consistently. “We need more innovation on a number of fronts. I’m the innovator,” he says. Highlights: Other taxes to be cut or reduced immediately include the corporate earnings tax, which could be modified with a revenue trigger; and the estate and gift tax. Would enact a “taxpayer bill of rights”; embrace “zero-based budgeting” by starting with a “blank sheet of paper, adding back only the services that are necessary. Click here and here for plan. Comments: Stefanowski was a high-level executive at General Electric, UBS and a payday lender in London. He’s used to cutting waste by ordering it done and appears to believe that will work in state government. His plan covers 26 pages but almost all of it documents how badly Connecticut’s economy has fallen. He worked out the plan with his consultant, Arthur Laffer, the economist under former President Ronald Reagan who made famous the idea, never proven, that lower taxes lead to higher revenues. Much of he plan comes from Laffer’s database of statistics and Stefanowski appears to have spent more time on data and less time learning the players and the quirks of the Connecticut economy. Big Idea: Restructure and renegotiate retirement liabilities as part of a cost reduction plan to enable $3 billion in tax cuts. Highlights: Lower income tax rates to a maximum of 5 percent, 4 percent for households at $50,000; use private partnerships to improve infrastructure including airports; reduce and restructure retiree benefits through buyouts and/or moving large numbers of people to 401 (k)-style plans; create an independent, locked financial trust for state assets to shore up pension plans; eliminate estate and business entity taxes; review all tax credits and exemptions; create a regulatory reform task force; fund schools based on performance. Click here and here and here for plan. Comments: Stemerman formed an investment fund in 2008 and it grew to nearly $2 billion before he closed it to run for governor, and now he’s using his background — including a law degree and an MBA, both from Harvard — to analyze the state economy in copious detail. He says unions must either agree to lower-than-promised retirement benefits or see the federal courts erode their pension rights under future Supreme Court Justice Brett Kavanaugh. “There is not enough money today nor will there ever be to fulfill the responsibility,” Stemerman said. He says his plan is a “fair deal” that’s better than state employees would otherwise see, but persuading unions to buy in or winning concessions in court are both steep hauls.